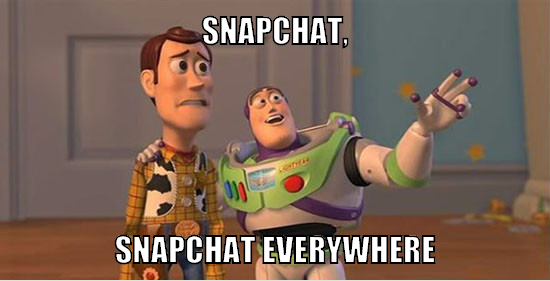 Snapchat. Make the most of your next ten seconds. Snapchat is a social media super giant. With 26 million active users, over half of which are between the ages of 18 and 24, Snapchat is stealing hearts and seconds. Snapchat is currently the most popular social media app among teens. In fact, 77% of college students are using the app at least once a day. I even have friends who claim to be “anti social media” that are using the app regularly. Which begs the question, why aren’t more colleges and universities jumping on the snapwagon? One of the easiest ways that colleges and universities can make their mark on Snapchat is through Snapchat’s custom, geo-targeted filters, or Geofilters. Think of Geofilters as free billboards. Brands can work with companies like Elliance 😉 to create custom artwork that users can apply directly to the snaps they share. There are two kinds of Geofilters, long term and short term (or as Snapchat has coined them, Community and On-Demand filters.) There are more rules and restrictions for the creation of free community filters, so I recommend that brands take advantage of the On-Demand option. On-Demand filters can be created for special events, like freshman move-in day or commencement. They can be applied to athletic stadiums for game days, or to particular gathering places on campus just for fun. Have a special guest coming to campus? Welcome them with a custom filter. GREEK week? Celebrate it with a filter. Accepted Students Day? Filter. Geofilters have the potential to raise brand awareness, encourage school spirit and increase student involvement on campus. Let us help you get started today. Want more? We’ve talked about the benefits of Snapchat for higher education on Aha! before, here and here.